Data is reshaping the world of financial technology. With increasing mandates and the rising volume of customer data, a unified platform is the answer. • Providing flexibility, extensibility and scalability to meet the needs of users via a unified data integration and analytics platform. 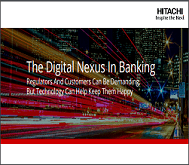 Forty-four of the top 50 global banks rely on Hitachi’s expertise to manage their complex enterprise data. Read the eBook to learn why.